Adelaide Damoah is a British artist of Ghanaian descent. Damoah’s current practice involves using her body as a printing tool with oil paint as a medium, later adding images and text to the work. She is inspired by a desire to subvert Yves Klein’s “Anthropométrie” series. Damoah engages in live performances of the first part of her creative process- body printing and writing. WIA: What are you doing today? Adelaide Damoah: I am preparing for my 31 hour performance which is starting this weekend! It is called “My Body is Present. An Homage to Ana Mendieta.” I performed one hour at a special event for Christie’s Education last month and the final hour will be performed at Bloomsbury Festival in association with UCL on the 20th October. That is 33 hours in total for this performance! 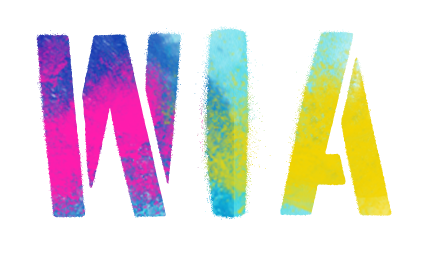 WIA: Tell us about your creative process. AD: I want my work to inspire people to elevate their consciousness so my creative process involves a lot of research before I begin to make the work and during the process of making the work as well as a lot of meditation and mindfulness practices which I feel feed the process and sustain me. AD: The actual making of work involves the use of specific techniques, but is at the same time very intuitive. Once I have absorbed everything I feel I need to absorb mentally, my work has three elements. Sometimes these come together in one piece and other times they result in separate pieces. In the studio, I use my body as a tool to make images using oil and pigment or paint. I often write on my work, and this can be a process of automatic writing or related to the particular subject that I am interested in at the time. The third element is the transfer of images onto the surface usually related to my family or connected to me or the subject matter by a moment in time or place. WIA: Describe where you do most of your creative work. AD: I do most of my creative work in my studio at Thames Side Studios in Woolwich. It is rather empty at the moment as most of the work is at the show. But when I am working, it is overflowing with artworks and there are always old photos and books for inspiration and brain food everywhere. WIA: What’s the most exciting project you’ve worked on? AD: I have worked on so many exciting projects of late, it is difficult to say! I am a member of a female artist collective called the BBFA and in the past year alone, tremendously exciting, projects have taken us to Ghana, Marrakech Morocco and Portland Oregon! Working with the collective is always exciting. However, I would say that working on Genesis with MTArt Agency and our partners Bloomsbury Festival and Ashby Capital has been really special because it has meant bringing the dream of my solo exhibition to life! I am currently preparing for the next phase of the “My Body is Present. An Homage to Ana Mendieta” performance, which will involve a 31 hour durational performance which will be live streamed from my studio. This to me is extremely exciting as I will be challenging myself in a way that I have never been challenged before because I want to inspire people – especially girls or anyone who feels marginalised – to push through the pain and discomfort that inevitably accompany the things we have to do in pursuit of our dreams. The periods of the most amount of growth for me have been periods when I have been through something difficult. This performance is in effect me inflicting controlled discomfort on myself to see what gems of knowledge await me on the other side. I am very much looking forward to seeing just how far I can push myself mentally and physically. WIA: What made you decide to become an artist? AD: I was diagnosed with a chronic illness called endometriosis early in my professional career in pharmaceuticals. This meant that I spent a lot of time off sick after having surgical procedures. Art was my comfort and helped me to heal emotionally from the trauma I experienced as a result of the illness. The more I was sick, the more I got to practice and learn. With time, people started to respect me as an artist. This boosted my confidence in a major way and in 2005, I made the decision to become an artist and I pursued it passionately. WIA: What are you currently working on? AD: I am currently researching an idea for a big project involving a sculpture that I have been dreaming about making for the past two years. I am so grateful to my agency for bringing this project into reality. I am also starting the process of delving further into a new process that I developed for making body prints in the past few weeks. I am very excited to see where both of these lead. WIA: Do you listen to music while you work, and if so, what’s your soundtrack? AD: I generally tend to listen to podcasts and audiobooks when I am making work. I am currently listening to a book called Science and Spiritual Practices by Rupert Sheldrake on Audible. It is super interesting and feeds into what I am currently obsessing about which is the link between science, religion and spirituality. When I do listen to music it can be anything from 90’s R & B to Giggs, Skepta, Ghanaian Afro beats, Bastille, Moses Sumney or Amy Winehouse. It all depends on my mood and on what I am doing. If I am dying paper or canvas, I tend to listen to music. When I am working with images, I listen to audiobooks and when I am making body prints I tend to prefer silence. WIA: What are the key themes in your work? AD: Because of the fact that I use my body both in the studio and in my performances, everything starts with the female body, agency and feminism. Layered on top of that I am constantly exploring my personal family history and how that relates to where I am in the world now. Memory, body memory, belonging and not belonging, culture, religion, colonialism and diaspora. These are my main areas of interest. WIA: What would you like people to notice in your work? AD: I don’t have a particular wish for people to take any specific messages from the work. I get energy when I see that my work sparks interesting discussions. This is my favourite thing to witness when people interact with the work. I have seen people discuss everything from the representation of female bodies on social media to nostalgia about their personal family history and photographs, colonialism and aesthetics and beauty in art. All are relevant because they are important to the people being inspired to discuss. I make what is important to me and I hope that people get something from it. WIA: What attracts you to the mediums you work in? AD: I am first attracted by the beauty of the material. I am currently obsessed with paint pigments and gold leaf. Second, I am attracted to mediums that are relevant to the subject I am working with. For example, using gold leaf was a no brainer for me because the country that is now called Ghana (where both of my parents were born) was once, in very recent history called the British Gold Coast. The Portuguese named it Gold Coast in 1482 due to the amount of gold deposits that were there. In addition to that, I recently discovered that my maternal great great grandparents owned significant quantities of gold. I wanted to connect with them somehow so it made sense for me to use it. I really wanted to use gold leaf from Ghana, but could not find any suppliers in the UK, so ended up using a supplier who gets it from China. Further investigation revealed that China is currently the biggest producer of gold world wide – which then linked me right back to Ghana as there has been a lot of discussion among Ghanaians about the diplomatic/political relationship between Ghana and China and who is benefiting most from it. I love it when materials have deep connections to what I am interested in. WIA: What equipment could you not do without? AD: I don’t use much in the way of equipment, my main tool is my body! However, I do use a laser printer, plenty of paper and acrylic gel medium for my image transfers. I could not go without that and my mobile phone. I used my iPhone to capture the image of my great grandmother that I have used so abundantly in my work. 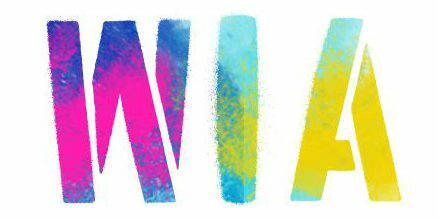 WIA: Who or what inspires you? AD: At the moment I am most inspired by the amazing women I am working closely with. They are my agents Marine Tanguy and Katrina Aleksa of MTArt Agency and my sister-friends from the BBFA Collective- Enam Gbewonyo, Arlene Wandera, Ayesha Feisal and Carleen De Sozer. They inspire me daily with their passion and drive. I am also inspired by a YouTube channel called Impact Theory. It is this amazing interview series run by a man called Tom Bileu. He interviews some of the most interesting high achievers in the world and he structures his interviews for maximum impact and inspiration for the viewers. I have learned so much from his series and have bought and learned from many books he has recommended on his show. I often listen to his interviews when I am driving to the studio right at the start of my day and they are always very inspirational. WIA: How does gender affect your work? AD: Because I use my body, my gender is at the center of my work and affects many different aspects of the work. AD: I am interested in gender from the perspective of how the kind of work I am doing changes in its appearance and how it is received when a woman does it. The inspiration for my performance “This is Me The Inconsistency of The Self” at UNFOLD Festival in 2017 was Yves Klein’s 1960 Anthropometries performance. During the performance he directed a number of young women to cover their bodies in his signature blue paint and press themselves onto the surface he was using to create his masterpiece. It was undeniably a beautiful work, but critique from feminists of the time was that he was creating passive female bodies, ripe for objectification by the male gaze. I was interested in how directing myself – as a female – would affect the work. More recently, I participated in a beautiful show at Gallery Different in Fitzrovia of all female artists, responding to a play called Picasso’s women. We were asked to think about what would happen to the image of a woman when made by women in the absence of the male gaze. This is at the heart of a lot of my work- even if it is not in such a direct way. WIA: What’s your favourite gallery, or place to see or experience art? AD: We have just come out of Frieze week and what a crazy week it was! Every year I look forward to Frieze. I love Frieze, but my favourite place to be during that week is 1:54 at Somerset House. The work there always feels fresh and vibrant and the atmosphere is always electric and exciting! WIA: If you could own one piece of art, what would it be and why? AD: It would have to be one of Ana Mendieta’s pieces from her 1982 “Blood Signs, Body Tracks” performance. For me, the performance was about female suffering, pain and even death. But it was also about life blood, hope and survival. This has so much personal meaning for me on multiple levels. This is the reason I am working towards a durational performance which is an homage to her in that it directly references this particular performance. WIA: If you could collaborate with one artist, from any time, who would it be, and why? AD: Definitely Ana Mendieta! I am completely obsessed with her work and her bravery as an artist. She pushed herself and her work in ways that not many are brave enough to. I would love for some of her courage to rub off on me. I think she would stretch me to my limits and I would relish that opportunity. WIA: Is there an artist, movement or collective you’d like to see re-evaluated, or a contemporary artist who is underrated? I think my friend, the sculptor Arlene Wandera is currently massively underrated. She represented Kenya at the last Venice Biennale. Thankfully, the art world is starting to wake up to her talents. I don’t think she will be underrated for much longer. My favourite colour has always been red, but I am growing increasingly fond of ultramarine blue. It evokes peaceful feelings in me and I could look into and be completely absorbed by a sea of pure ultramarine blue pigment forever.